As you know, I love to find apps kids can use to create with. 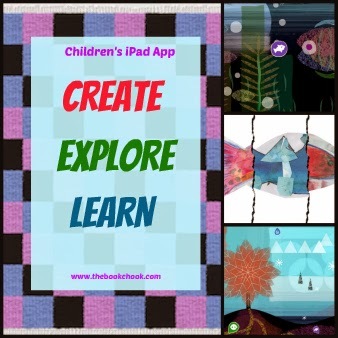 Here's a lovely app that encourages kids to create, explore and learn. And it's my favourite price - free! From the developers: This app lets your child use their imagination to create their own wonderful artworks, to explore the vibrant spaces and places of The Royal Children’s Hospital (RCH) Melbourne and to learn about the artists, designers, zoo keepers and divers who all contribute to make the RCH a truly great hospital. Create meerkat collages, draw your own pixel tapestries, balance mobiles, play with flipbook fish and make your own creatures. The RCH in Melbourne is home to some wonderful features and special creatures that help to make the hospital an exciting and uplifting place for children and families. This app lets you explore and interact with some of these wonderful installations. You don't need to be at the hospital to enjoy this app. What I liked: I love the way the RCH has not only succeeded in thoughtfully integrating fun and interest into their premises, but used an app as well. How cool that kids anywhere in the world can create with the app, and ultra cool that children in or about to enter the hospital can discover more about it. Sometimes sick youngsters need entertaining or distracting, and the app achieves that beautifully, along with allowing kids opportunities to create and learn about others’ creations. In the app itself, I liked the way kids are encouraged to explore a fantasy landscape to discover zones that lead to the different apps within the app. Free is always good, and the app is currently free. Children can create a digital tapestry, sculpt a creature, make a fish and create a meerkat collage. All of these can be saved to the camera roll to share with others. You can see the fish and the tapestry I made, along with some screenshots of the beautiful artwork, in my collage above. Note: at 338MB, it’s a largish file, so make sure you have room on your iPad before you download.